which has created artificial islands in the waters to the annoyance of other claimants. 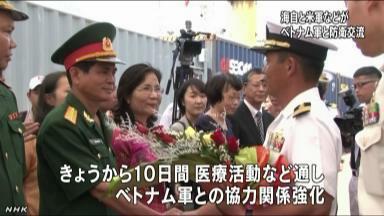 between the MSDF and the Vietnamese military. which heavily depends on seaborne trade, views the South China Sea as an important sea lane. the scope of potential SDF activities in the South China Sea could expand. Vietnam plans to build new port facilities to receive the MSDF and other vessels. Nakatani hopes to realize the port call within the next year, according to the officials. it will limit port calls to when its vessels embark on ocean voyages. proactive pacifism” and Thanh expressed strong hope over the role Japan can play. 1+11 ：ロンメル銭湯兵 ★＠転載は禁止 [↓] ：2015/11/07(土) 19:54:10.18 ID:?? ?